Drug overdose deaths are on the rise, and from 1999 to 2009 rural U.S. counties saw a larger jump in these drug-poisoning deaths than their urban counterparts. While the highest death rates were seen in central metropolitan areas during this period, the rate grew by 394% in rural counties compared to a 279% spike for large urban metro areas. Throughout the United States, the drug-poisoning death rate increased 300% over the past three decades, and is now the leading cause of injury death in the United States. About 90% of poisoning deaths are attributed to illicit or legal drugs, and prescription drugs account for the majority of drug overdose deaths. All of this and more is presented in a new study that takes a look at drug overdose deaths in the United States — county by county. The study was undertaken and penned by three National Center for Health Statistics (NCHS) researchers in Hyattsville, Maryland. You can find their work, “Trends and Geographic Patterns in Drug-Poisoning Death Rates in the U.S., 1999-2009,” in the December 2013 edition of the American Journal of Preventive Medicine. At NCHS, we’ve produced a number of reports on this topic — “Drug Poisoning Deaths in the United States, 1980-2008,” and “Increase in Fatal Poisonings Involving Opioid Analgesics in the United States, 1999-2006,” — but these earlier reports focused on state death rates. The new study in the American Journal of Preventive Medicine is the first to examine drug poisoning mortality on the county level. It’s this type of county mapping that can enhance efforts to bring preventive programs to geographic areas that could benefit most. Assisted living and similar residential care communities provide an alternative to nursing homes for individuals with dementia who can no longer live independently. In 2010, about 42% of individuals living in residential care communities had Alzheimer’s disease or other dementia. Individuals with dementia can live in residential care communities that have dementia special care units, or in a more traditional setting where these residents are integrated with residents without dementia. Many states require residential care communities with dementia special care units to have certain physical features (e.g., locked door) and specially trained staff to care for residents with dementia. NCHS has put out a new report that compares residential care communities with and without dementia special care units. In 2010, 17% of residential care communities had dementia special care units. Beds in dementia special care units accounted for 13% of all residential care beds. Residential care communities with dementia special care units were more likely than those without to have more beds, be chain-affiliated, and be purposely built as a residential care community, and less likely to be certified or registered to participate in Medicaid. Residential care communities with dementia special care units were more likely than those without to be located in the Northeast and in a metropolitan statistical area, and less likely to be in the West. High cholesterol is a risk factor for heart disease, which is the leading cause of death for both men and women. Nearly 600,000 people die of heart disease in the United States every year–that’s 1 in every 4 deaths. Every year about 715,000 Americans have a heart attack and the costs of coronary heart disease alone costs the U.S. over $100 billion annually. This total includes the cost of health care services, medications, and lost productivity. Although cholesterol levels may be reduced by dietary modifications and increased physical activity, these lifestyle changes are often difficult to maintain or not sufficiently effective. In those cases, or for persons with other risk factors for heart disease, the use of cholesterol-lowering medications is often suggested. Widespread belief in the value of drug therapy to lower cholesterol—and consequently to reduce mortality from heart disease—began with the introduction of statin drugs in 1987 and published studies that proved their effectiveness. There are several classes of cholesterol-lowering drugs, but statins have become the drug class of choice because of their demonstrated efficacy and safety. 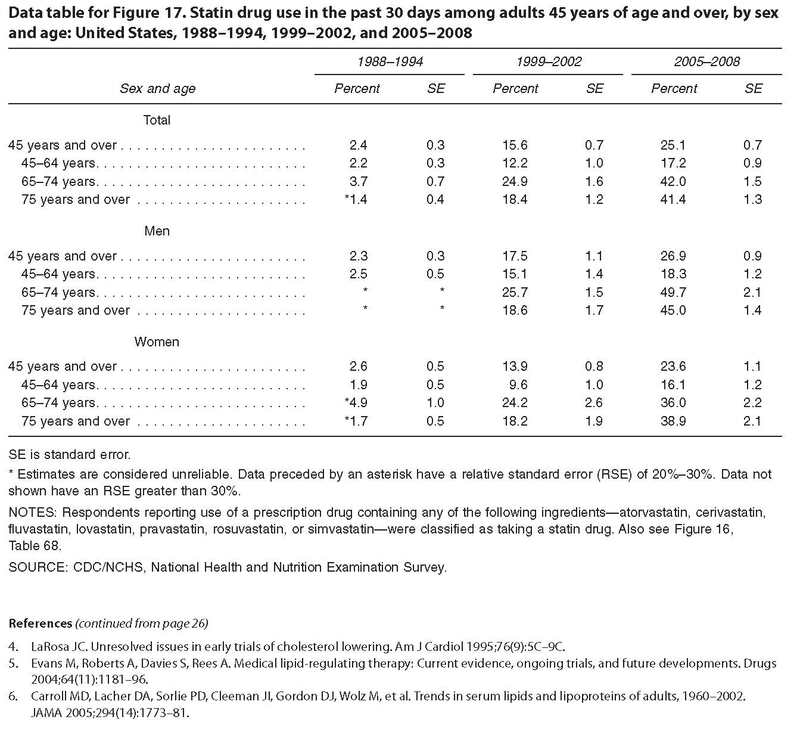 From 1988–1994 to 2005–2008, the use of statin drugs by adults 45 years of age and over increased 10-fold, from 2% to 25%. There was a concurrent decline in the percentage of Americans with high serum total cholesterol (greater than or equal to 240 mg/dL) over this time period, which may be attributable to increased use of cholesterol-lowering medications, especially statins. Both men and women are increasingly taking statin drugs. However, in 2005–2008 one-half of men 65–74 years of age took a statin drug in the past 30 days, compared with just over one-third of women in that age group. A new report from NCHS shows that hypertension affects almost one-third of the U.S. adult population. 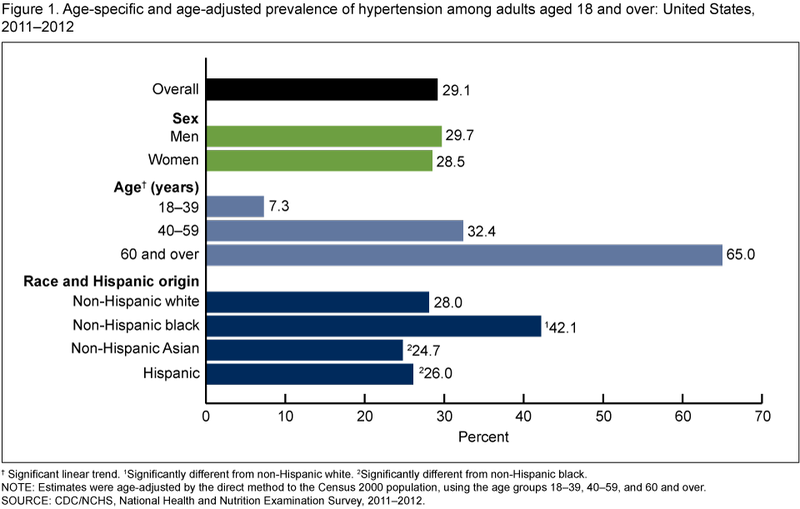 In 2009–2010, nearly 82% of adults with hypertension were aware of their status, and nearly 76% were taking medication. Despite considerable improvement in increasing the awareness, treatment, and control of hypertension, undiagnosed and uncontrolled hypertension among minority groups remains a challenge. This report presents survey results for 2011–2012 on the prevalence, awareness, treatment, and control of hypertension. You are currently browsing the NCHStats blog archives for November, 2013.